Modern conservatism, which has proven to us repeatedly that it can’t manage the economy effectively, prosecute a war successfully, or win the White House honestly any more, is very adept at one thing: Whining. Conservatives are really good at it. They’re the Bobby Knight of political parties. They throw a lot of chairs. They know how to work the refs, i.e. the media, and get them to buy into a narrative they create not quite out of whole cloth, but out of very little. Are you old enough to remember the first Al Gore-George Bush debate in 2000? If so, you know what I mean. Gore let out an exasperated sigh a few times when Bush told obvious whoppers like that the vast majority of his tax cut would be going to the middle class. Yes, Gore came off as haughty, but in the immediate aftermath of the debate, it just wasn’t one of the major takeaways. A few days later, Gore’s “elitism” had become The Story of the debate. Insta-surveys showed that Gore won the debate as it happened, but by the time the right was done spinning it, Bush was the winner. Likewise, you might remember the funeral of Minnesota Democratic Senator Paul Wellstone in 2002. He died tragically that October in a plane crash while campaigning. Most of the senators of both parties went to his funeral at a Minneapolis basketball arena. When the JumboTron flashed the face of GOP Senate Leader Trent Lott, some people booed. It was wrong. I remember shouting “No!” at the television. But again, it wasn’t really that many people, and it wasn’t what people cared about at the time. Within a few days, though, it became The Story—conservative commentators had America believing that the funeral was nothing but a fiendishly partisan hootenanny. Two weeks later, a Republican won Wellstone’s seat. I could fill five columns with examples, but you get the idea, so let’s cut to the chase. 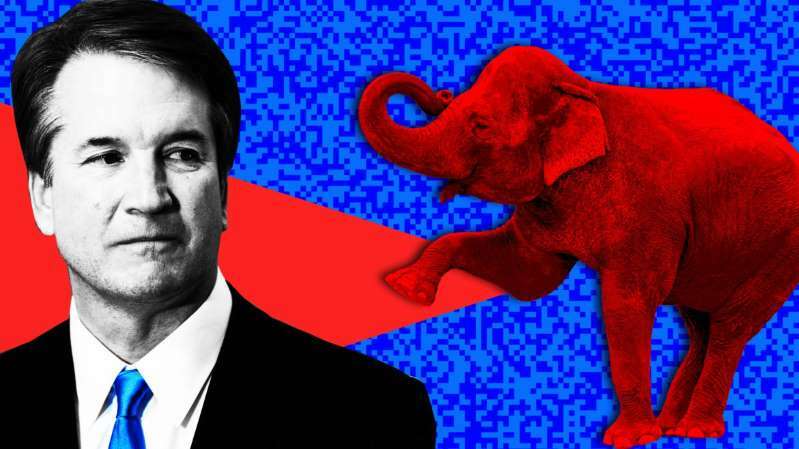 Republicans and conservatives are going to spend this week trying to drive home the narrative that the left’s opposition to Brett Kavanaugh was unhinged, un-American, and out of touch with the decent people of the heartland. They’ve already started, as you’ve probably noticed. “Progressive psychosis.” “Insane, disgusting.” And so on and so on. Okay, here are two points I will concede. One, average people don’t like protestors. They never have, even when they agree with them. By mid-1968, a firm majority of Americans opposed the Vietnam War. But most of those Americans still didn’t like the protestors who marched against it. Dirty hippies. Get a job. Think public opinion backed Martin Luther King marching across that bridge? Think again. This obviously doesn’t mean people shouldn’t protest. It just means we should be aware of this reality. Two, undoubtedly some protestors or commentators or Tweeters went too far. Impolite and plain nasty things have been said about Susan Collins since last Friday. And of course about Kavanaugh himself. People are angry, and angry people sometimes say inappropriate things. But let’s be crystal clear about this: Liberals are not the ones who are out of touch. Conservatives are. Virtually every poll I saw showed healthy pluralities and sometimes outright majorities opposing Kavanaugh’s confirmation. An NPR-PBS-Marist poll had it 52-40 against. News reports didn’t often provide this context I’m about to give you, but this was astonishing. Historically, most people don’t pay close attention to Supreme Court nominations, and they just assume that if the president someone, there must be a good reason. Strong pluralities continued to back Clarence Thomas in 1991 even after Anita Hill testified. It’s extremely unusual, and possibly unprecedented, for most Americans to oppose a Supreme Court nominee. But it’s the case here. It is also a fact that more Americans believed Christine Blasey Ford than believed Kavanaugh. That same NPR-PBS poll had it at 45 percent believing Ford, and 32 percent Kavanaugh. Republicans, not Democrats, are in the minority. Yes, they do have a majority in the Senate, which is why this happened. And Kavanaugh passed by one vote. His 50 votes may have represented in this case the bare majority of the Senate, but the senators who voted to confirm him do not represent 50 percent of the country. It isn’t even close. Assigning half a state’s population to each voting senator and doing a little rounding produces the result: Senators who voted for Kavanaugh represent around 145 million Americans, while senators who voted against him represent 181 million. That’s 56 to 44 percent, with the will of the majority brazenly thwarted by the most unrepresentative legislative body in the democratic world. And of course let’s not forget, and yes it’s fair and entirely relevant, that Kavanaugh was nominated in the first place by a president who lost the popular vote and of whom a minority of Americans approve. Angry? You bet we are. But crazy? Out of touch? Absolutely not. We who oppose Kavanaugh are the majority. We are the decent people of the heartland. Do anything you can this week to help make sure they don’t get away with saying these things. Email or tweet mainstream journalists you see falling for this meme. Politely remind coworkers that more Americans opposed Kavanaugh’s elevation than supported it, and that more Americans believed Dr. Ford than believed him. Whatever you can do. The ultimate goal of the conservative narrative is to create an atmosphere that depresses Democratic turnout. They’re doing this because they’re terrified that what they’ve done is going to send turnout among liberals and women in particular through the roof. On that one point alone, let’s go out on November 6 and prove them right.